PDR Online is proud to introduce a new PDR training package with instruction plus repair automotive tools for those whom want to get started immediately into the PDR industry. We want to make the best and cheapest PDR training package on the market today, and one thing we have noticed with people that don't fully understand the PDR Online training concept, is that they believe they could get a few tools and a practice panel and teach themselves. That is right you can, but only if you have the right information and the right automotive tools, that's where we come in. Let's go through what the PDR package includes. This is the new hail training rod, this little beauty is one of the quickest automotive tools on the market for experienced techs, and one of the best training tools for you new to the trade. The tips are interchangeable and this rod comes with the 3 most widely used, Sharp, Blunt, and round. For more information about this hail training rod click here. 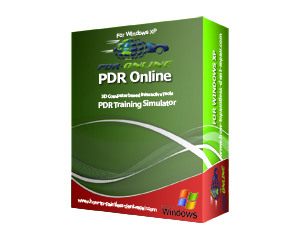 Add to that training tool, PDR Online training software. A fully interactive training simulation on your PC, with full video tutorials and real time correction methods. This program will allow you to peel away the layers of the metal to see exactly how to take that dent out, so that when you are practicing you will have more of an understanding of the process you are trying to achieve. For more on PDR Online please watch some of the videos found here on the site or head here. Next we are going to give you a PDR Training DVD, this DVD covers all different aspects of PDR including lights access and dent removal. This standard DVD will play in any DVD player, and is designed as a stand alone training visual. You will also need some accessories to help get you started, so we will include a knock down tool, and a S hook to help finish out those jobs. All you need to do is supply a practice panel and some determination and you are well on your way to getting started in the PDR industry. What about the lot for just $400 Australian dollars plus $50 postage. There is no training automotive tools on the market today that even comes close to this package in value for money. If you are interested in PDR, or want to add to your current skill set it simply doesn't get any better then this. To have a look at more automotive tools click here.